ReconRobotics Inc. in Edina, Minnesota has unveiled a compact and lightweight robotic device for military, police, and emergency-response applications. The company plans to demonstrate the Throwbot XT Reconnaissance Robot at the Eurosatory defense and security exhibition, 11-14 June in Paris. 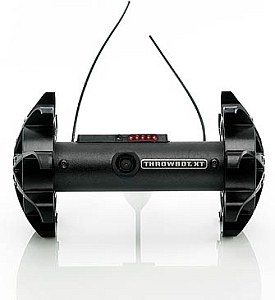 The Throwbot is designed to be physically thrown into harm’s way by military, police, and fire teams to quickly gain a greater awareness of situations during high-risk operations and surveillance missions. The device weights 540 grams (1.2 pounds) and can be thrown up to 36 meters (120 feet). Throwbot operates quietly and has an infrared optical system that activates automatically in low ambient light, which enables the operator to see in complete darkness. Once deployed, the device can be directed by an operator to move through a structure and transmit video and audio back to a handheld control unit. The ability to move quietly and unobtrusively can help locate armed subjects, confirm the presence of hostages or innocent civilians, listen in on conversations, and reveal the layout of rooms. The robot can also be deployed in teams of up to three units, each assigned a separate transmission frequency. ReconRobotics was formed in 2006 to commercialize technologies developed at University of Minnesota’s Distributed Robotics Laboratory under funding from the Defense Advanced Research Projects Agency. The company says some 3,700 of its small robots have been deployed by the U.S. military and allied forces, including 2,000 units in Afghanistan. Some 500 police tactical teams and bomb squads worldwide use its robots as well, says the company.